Bring the holiday spirit to your breakfast table with this easy, ready in under 10 minute meal the whole family will enjoy. 1. Before preparing oats, combine cranberry, maple syrup and water in a small saucepan and simmer on low, stirring often, until a thick syrup is formed. 2. Combine oats, DF milk, salt, cinnamon, and water in a small saucepan and bring to a boil. Once boiling, bring down to a simmer for 3 minutes, and set aside. 3. 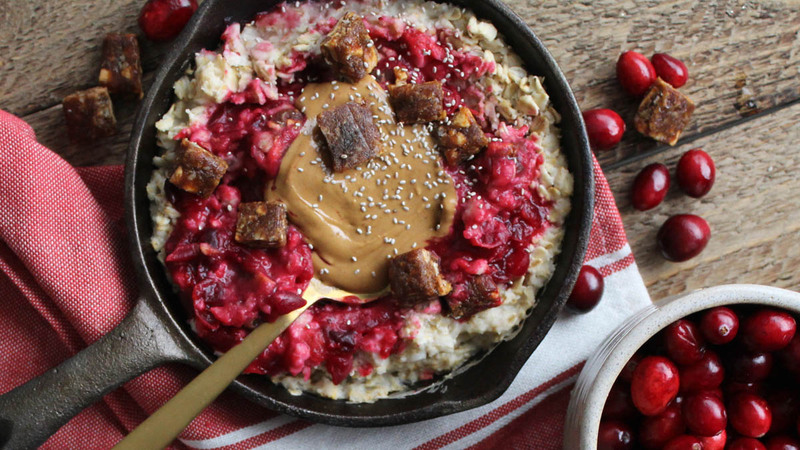 Top oats with cranberry reduction, ½ apple cinnamon MacroBar, 1-2 tbsp of peanut butter and chia seeds. - Enjoy!